Here is my Stuck?! layout, I loved the star in the sketch but I wanted to use three photos instead of two, so I scaled it down a bit. This is my My Creative Sketches layout, the clean look really appealed to me, I really enjoyed working with this sketch! My pics were a bit a larger than the sketch so I flipped the bottom pic to the top. Wow, such great pages! Love the colors and fabulous layers. Thank you for joining us at Stuck?! Sketches! Love the sketches and how you were able to work them together! Adorable layouts! Such beautiful layouts! I love how you combined the two sketches to create a double layout! What a brave little girl you have! Thanks so much for playing along with us at Stuck?! Sketches! 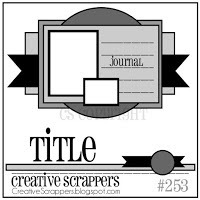 Love your stamped background ! Thank you for playing at Stuck?! Sketches ! Adorable! I love the stitched frame. Thanks for joining us at Stuck?! Sketches! Both pages are so darling and certainly do look perfect together. Thank you for playing along at MCS. Amazing layouts - love them! Thank you for playing along with us at My Creative Sketches!